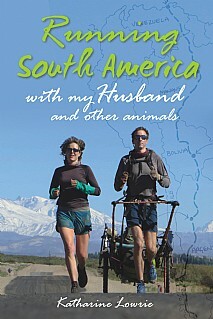 It is the story of two everyday runners, Katharine and David, who decided to take on a continent and learn how to run again – barefoot, pushing their bodies and minds to levels they had never considered possible in a bid to become the first in the world to run the length of South America, to give a voice to the wildlife and wildernesses they adore. Running laid them bare, stripped them of the shell people journey within, so all they had to rely on was their own bare feet. Yet this very vulnerability provided the key to unlocking communities who would fling open their doors, tuck them under their wings and whisper their secrets. Amazing animals accompanied them: gigantic vaulting stick-insects; cackling macaws who wheeled and pirouetted in the sky, desperately trying to gain a better view of them; and a giant anteater whom they stalked through a snake-infested swamp, so they could stand within an arm’s length as he devoured termites upon the end of his long sticky tongue. It was also an animal, if one of the most diminutive, that nearly succeeded in ending their dreams of conquering the continent – an ant! But when their joints and muscles were screaming, when they couldn’t stand the sight of one another and when prickly heat, blisters and tropical ulcers infested their skin, it was the wildlife and wildernesses that pulled them through. Day after day, for months on end, running from freezer through desert and into the biggest rainforest on earth, they survived hurricane-force winds, near 100% humidity, swarms of biting insects and some of the most crime-ridden places on the planet. The expedition nearly cost them their marriage, health, sanity and lives. But somehow, they made it to the other end of the continent, 6,504 miles and 15 months later, when they splashed into the warm and much-dreamed of Caribbean Sea. This a truly amazing and involving story which will be of huge appeal to all runners, extreme sports enthusiasts and everyone with an interest in wildlife and the natural world.